Erdogan says death sentence for ousted Egyptian president means Egypt is "turning back into ancient Egypt". Turkish President Recep Tayyip Erdogan on Saturday night blasted Egypt for sentencing ousted President Mohammed Morsi to death, AFP reported. "The popularly elected president of Egypt, chosen with 52 percent of the vote, has unfortunately been sentenced to death," he said at a rally in Istanbul, to howls of protest from the crowd. "Egypt is turning back into ancient Egypt," Erdogan charged, referring to the old Pharaonic rule of the land that ended over two millennia ago. "The West, unfortunately, is still turning a blind eye to Sisi's coup," he continued, referring to current President and former army chief Abdel Fattah al-Sisi, who is now president after winning elections last year. "While they (the West) abolished the death penalty in their own countries, they just look on as spectators at this execution in Egypt," charged Erdogan, according to AFP. 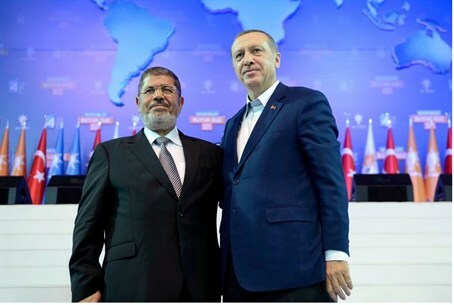 Erdogan, at the time Turkey’s Prime Minister, was a strong supporter of the Islamist Morsi and his Muslim Brotherhood, after Morsi won the 2012 elections. Erdogan has continued to attack Sisi since his election, including last summer when Egypt was trying to broker a ceasefire between Egypt and Hamas. Erdogan said at the time that Sisi was an “illegitimate tyrant” and added Cairo could not be relied upon to negotiate a truce with Israel.